"In a buyer’s market for BigLaw services, corporate clients are increasingly demanding — and getting — firms to shoulder the risk of unforeseen or unwelcome outcomes from legal work, experts said at a Thursday gathering of professional liability specialists." "While broad indemnity provisions being built into outside counsel guidelines vary in breadth, the more onerous seek to force firms to take responsibility for costs of even unsuccessful challenges related to legal work, documents, or transactions, or lawyer 'mistakes' that don’t resemble malpractice." "Anthony Davis of Hinshaw & Culbertson LLP and other panelists at an American Bar Association conference in Boston noted that the full risk of the rising tide of such indemnity agreements is still unclear, even as they have become a common feature of corporate counsel contracts. So far, only a single court has issued a ruling on the enforceability of a firm indemnity agreement with a client absent a finding of a legal error. But that ruling went against the firm, raising the specter that others will be forced to bear the costs of some unforeseen client dispute with only a distant relationship to their work." "Speaking to about 60 malpractice specialists and insurance professionals at the ABA’s National Legal Malpractice Conference, Seyfarth Shaw LLP general counsel Lori Roeser said her worries about the new breed of guidelines include partners signing them without a careful look and then filing them away without notification to the business." "The firm now requires all such guidelines to be submitted to her office, she said, and includes a reminder on conflict intake forms. 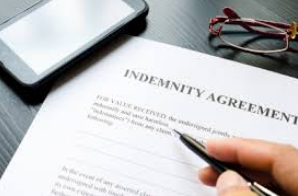 Seyfarth also has an indemnity provision 'checklist' to determine if the guidelines could put the firm on the hook for future disputes not covered by their policy, and if so, for what."